Our regrets at the loss of this fine young officer. May he rest in peace. May your soul Rest In Peace in the House of our Lord. Thank you for your service, and making the ultimate sacrifice in doing what you loved. Our Lord and savior needed a warrior to come home today. While we have never met I know you all too well. You are that young man who choose others over self, you chose to serve and protect no matter the cost. You always ran to the fight and gave your all so that we may enjoy a freedom is this Country unlike any other in the world. You are an American Police Officer and now you will protect us from above and we will carry on for you here. We are family and we will always watch out for your loved ones here on earth. You make me proud to be a police officer my brother in Blue. Thank you hero. Rest In Peace. Rip officer Tuder God bless your family. Our thoughts and prayers are with your family and your department family. May you rest in the loving arms of God. Thank you, and your family for your sacrifice. Thank you for your service officer Tuder. Very sorry to hear about the death of Ofc. Tudor in the line of duty. He and many others want to be able to enjoy their life under peaceful conditions. Knowing that this kind of behavior will not be tolerated much longer is comforting to me and I hope you too. There's One who can straighten it out and has the Supreme Power to bring eternal peace to our planet. Please read from Holy Bible in Psalms 37:9-10, and 29. Those that have died have the hope of a resurrection by means of Jesus, God's son. This scripture has brought me hope and it can you too. Luke 20:38 "He is a God, not of the dead, but of the living, for they are all living to him." So Ofc Tudor has that hope too, to be raised again to a new earth full of peace. Any Jehovah's Witness will be glad to discuss this hope further at your home or our place of worship @ Kingdom Hall of Jehovah's Witnesses locally. Rest in Peace Officer Tuder. Thank you for your service. My thoughts and prayers are with the Tuder Family and the Mobile Police Department. BLE 10-03 Unity Pride Loyalty. I had the awesome privilege of being Sean Tuder’s class leader in 2010. He was one of a kind and our class clown. Sean you will be missed greatly by your classmates and all who had the distinct pleasure of knowing you. Rest in glory my friend. You will not be forgotten. Rest easy brother, we will take it from here. It is a sad time for the Mobile, AL Police Department as they mourn the loss of a three year veteran who was out to serve a warrant to a suspect who was faking an abduction with a few other officers from the Mobile, AL Police Department. 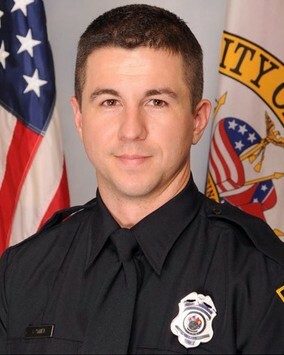 I am sure his family, the entire City of Mobile, AL and the Mobile AL Police Department mourn the loss of this brave Police Officer who lost his life with a dangerous criminal. He will be missed by everybody. May God bless you young officer, thank you for your service to our great nation. May the Peace of Jesus be with you and your family now and forever. Salute good sir. Thank you for your service. Prayers for Family & Department. The memories of your honor & of your service will never go in vain. Rest In Peace. Rest in peace brother. We’ll hold the line. Sean you will not be forgotten. Prayers and condolences to the Tuder family and the Mobile Police Department. Rest easy Brother. May God bless your family and show His presence in this time of grief. You did not die in vain but serving a greater good that few will ever understand.